Last night I watched Furious Seven on Blu-ray. 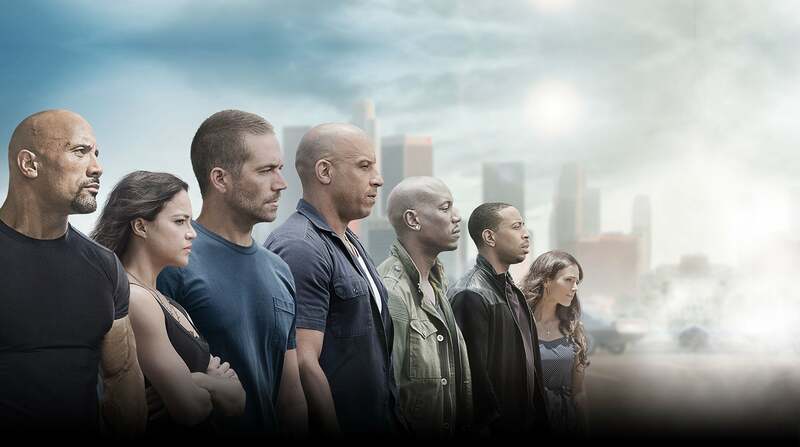 The seventh movie in the Fast and Furious franchise, it will probably be the last due to the untimely death of Paul Walker. While Furious Seven wasn't as improbable as Fast and Furious 6 was, it still bordered on the ludicrous. In my review of six I proposed a new genre: "real world fantasy." That's because what happens in these moves that are set in the "real world" is almost fantasy. People survive car wreaks that would result in serious injuries or death in the real world. Cars move in ways they can't in real life. And a hacker turns out to be a pretty female. Not very realistic at all. (Okay, that last one is probably more probable than some of the other things in this movie.) And I love when people jump out of moving cars onto pavement and don't get a scratch. In one scene they are chasing a bus (or large RV) with the hacker as a prisoner on board. The sides of the bus open to reveal miniguns that proceed to shoot up Paul Walker's Subaru. Okay, that should have killed Walker's character. So the character driving the bullet-proof vehicle cuts between the guns and the car. But the bullets are then declared "armor piercing." Yet no one whose vehicle is shot up is hurt. Well, except later when the bad guys get shot up. And they never explained how the bad guy (Jason Statham) kept showing up wherever the good guys were. I was expecting there to be a leak in the government secret agency they were working with. But nope, no explanation. So, yes, it was a fun (and loud) movie but park your critical thinking skills at the door. And it seemed that Chrysler had some deal with the movie makers. Every time there were cars, there was at least one Mopar product, usually vintage (like an old Charger) but sometimes new. In one scene there are four cars driven by the good guys: a McClaren, a Ferrari, a Bugatti, something black I didn't recognize but obviously a supercar (the black color made it hard to discern the shape), and a new Dodge Charger. Of course, Chrysler is owned by Fiat, as is Ferrari, so they got two cars in that scene. I gave Furious Seven three stars on Netflix mostly because I was mostly entertained. I just wish they'd cut the hand-to-hand fighting scenes for more car chases or shots of scantily-clad women.